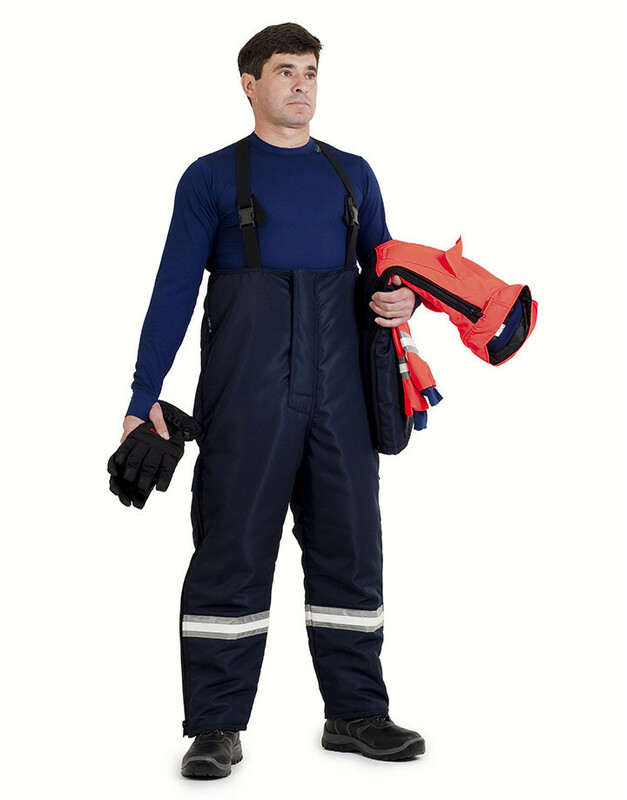 This PPE corresponds to a pair of bib and brace trousers with elastic suspenders and a high waist that rises to shoulder blade height for greater back protection. It has a zippered front closure with a placket that fastens with 2 snaps. To facilitate putting them on, the outside of both leg bottoms include a zipper with a velcro-fastened protective flap. At waist height in the interior of each trouser there is a velcro-fastened elastic strap to prevent the loss of heat. It has a patch pocket on the back. To achieve greater visibility both legs have 3M Scotchlite Bright Silver reflective bands attached around them and on top of the bands a photo-luminescent strip that provides visibility even in total darknes.